Renting out your driveway has become popular way of utilising unused space and earning a bit of spare cash at the same time. But you could make a bit more money by renting out spare garage space instead. The added security and protection from the elements make it more valuable, especially if the person looking for the space has an expensive or well loved car. In Hertfordshire, renting out your driveway could earn you up to £100 a month or possibly a bit more. Figures for renting garages aren’t available, but it’s a fair bet that people will be willing to pay more. Outside of the business districts and central London, people are most likely to be looking for parking spaces near major transport hubs. So if you live near the railway station, commuters will always be on the lookout for cheaper and safer places to park than the official car parks. This would provide a great regular income on a long-term basis, leaving you the use of the garage at weekends. If you’re close enough to Stansted Airport or Luton Airport, rent your garage on a short-term basis to holiday-makers and long distance business travellers. It’s unlikely that you’ll in walking distance of the departure lounge, so give people an idea of how much a taxi will cost to take them to and from the airport and how long it will take. Point out if you’re near a bus stop and how frequently buses run (if someone’s searched your garage or driveway out because they want to save money on parking, a local bus route will definitely be a selling point). Other people looking for short-term or periodic parking spaces will be sports fans, especially season ticket holders. So if you live near a football stadium, rugby ground or any other place which attracts a loyal and regular following, it’s something to consider. People searching for a garage to rent in Hertfordshire (or wherever) will probably do it through one of the specialist websites, e.g. justpark or parklet. They’ll also be handy to find out how much you’ll be able to charge – just look at the details of other spaces advertised in your area. If you’re interested in offering your garage or driveway for rent, there’s some good advice on moneysavingexpert, with a forum where people have shared their experiences. 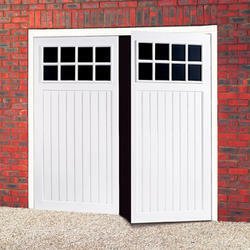 Just think, a bit of extra income from renting out your garage could pay for a smart new garage door! (And the added security a new door brings could allow you to put the rent up…) If you’re looking for a new garage door in Hertfordshire, we have a wide range of high quality roll-up, sectional and ‘up & over’ ones to choose from.